ITR: Plum plays third game in eight days, Franklin Regional travels down the street. Delmont, Pa.- Last week the Franklin Regional Panthers celebrated their seniors and hosted the Plum Mustangs. The Mustangs started out the game flying while putting up 14 shots on goal against the Panthers 4. Out of the 14, Plum received two goals, Anythony Adamski on the powerplay (11:35) and Logan Schlegel (16:09). Franklin Regional found their legs midway through the second as Oldrich Virag (7:15) found the back of the net for the Panthers first goal of the night. That was followed by two quick goals by Ronald Fleck (7:53) and Trent Lunden (8:58). The Mustangs had issues answering back and the Panthers secured their 5-2 victory in the third off the sticks of Jacob Rettger (2:32) and Trent Lunden (3:44). Franklin Regional went 0 for 5 with the man advantage and Daniel Soltesz stopped 21 of 23 shots on goal. Plum had 1 powerplay goal on 4 chances and Samuel Pine stopped 24 of 29 shots on goal. 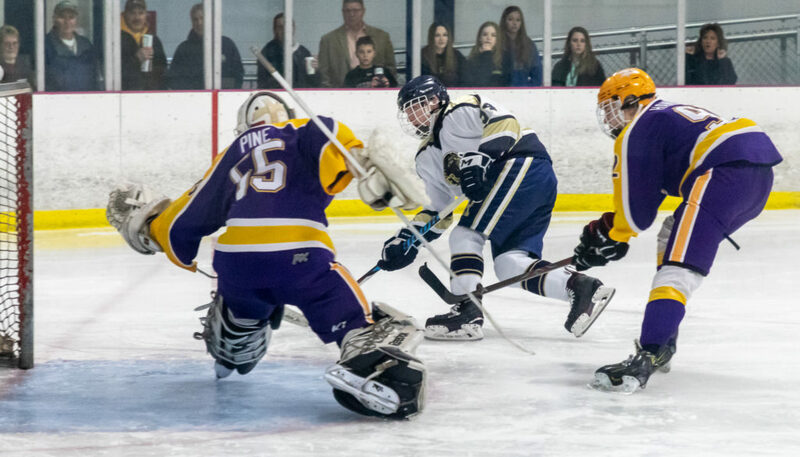 Plum will be at home for their third game in 8 days as they host the Hampton Talbots from the Northwest on February 11th. The Talbots will be looking to bounce back after a 5-4 lose against Quaker Valley last week. Michael Orban leads the Talbots with 41 points (17G/24A) and Jacob McGee has a SV% of 0.875. Anthony Adamski leads the Mustangs with 24 points (10G/14A) and Joseph Miller has a SV% of 0.846. Franklin Regional will have a showdown with the Spartans from Hempfield on February 11th at Kirk S. Nevin Arena in Greensburg. Right down the street. Hempfield currently sits 2 points ahead of Franklin Regional with both teams having 2 games remaining. This could be a deciding factor on who gets that third seed out to the Southeast if both teams tie at the end of the season. The Panthers holds a 5-4 victory over the Talbots that was on November 5th. Hempfield got a 4-1 victory over Baldwin in their last outing. Oldrich Virag leads the Panthers with 27 points (9G/18A) and Daniel Soltesz has been strong in net with a SV% of 0.890.